Here are all of the top drug store deals starting 11/17. Many stores are holding off on the best deals until Black Friday, but there are still a lot of great deals. For those just getting started with Drug Stores, you can go here for a Q&A session on how to get started. You can see all of the CVS deals here. -$1 off Crest Rinse, 458 mL+, Booklet in Puffs 3 pk. –Like getting it all for $4.65 or $1.16 ea. -$1 off Olay bar, body wash or in-shower body lotion, excl Simply Olay and trial size, Booklet in Puffs 3 pk. Get Back: $5 ECB — like getting it all for $18 or $3.60 ea. Get Back: $4 ECB — like getting it all for $4.98 or $1.99 ea. You can see all of the Rite Aid deals here. 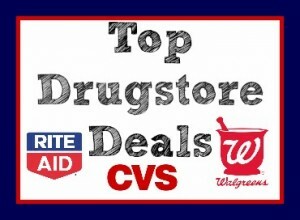 See all of the top Walgreens deals. -$1 off Oral-B Glide floss, 35 mL+ or Glide floss picks, 30 ct.+, Booklet in Puffs 3 pk.